In clothing, clothing size refers to the label sizes used for garments sold off-the-shelf. There are a large number of standard sizing systems around the world for various garments, such as dresses, tops, skirts, and trousers. Made-to-order garments require measurements to be taken, but these do not need to be converted into national standard form. Before the invention of clothing sizes in the early 1800s, all clothing was made to fit individuals by either tailors or makers of clothing in homes. Then garment makers noticed that the range of human body dimensions was relatively small. Therefore sizes were invented to allow mass production of garments. Horizontal torso measurements include the neck circumference, the shoulder width, the bustline measurements – over-bust circumference, the full bust circumference, the bust-point separation, and the under-bust (rib-cage) circumference – the natural waist circumference, the upper hip circumference and the lower hip circumference. Vertical torso measurements include the back (neck-waist) length, the shoulder-waist length (not the same as the back length, due to the slope of the shoulder), the bust-shoulder length, the bust-waist length, and the two hip-waist lengths. Sleeve measurements include the under-arm and over-arm lengths, the fore-arm length, the wrist circumference and the biceps circumference. However, because of the drape and ease of the fabric, not all measurements are required to obtain a well-fitting dress in most styles. ISO 3636: 1977, Size designation of clothes - Men’s and boys outerwear garments. 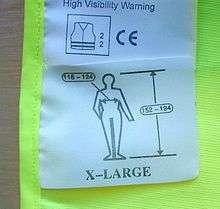 ISO 3637: 1977, Size designation of clothes - Women’s and girls outerwear garments. ISO 3638: 1977, Size designation of clothes - Infants garments. ISO 4415: 1981, Size designation of clothes - Mens and boys underwear, nightwear and shirts. ISO 4416: 1981, Size designation of clothes - Women’s and girls’ underwear, nightwear, foundation garments and shirts. ISO 4417: 1977, Size designation of clothes - Headwear. ISO 4418: 1978, Size designation of clothes - Gloves. ISO 5971: 1981, Size designation of clothes - Pantyhose. ISO 7070: 1982, Size designation of clothes - Hosiery. intended to replace the existing national standards of the 33 member states. It is currently in common use for children's clothing, but not yet for adults. The third standard EN 13402-3 seeks to address the problem of irregular or Vanity sizing through offering a SI unit based labelling system, which will ALSO pictographically describe the dimensions a garment is designed to fit, per the ISO 3635 standard. Slovenia, Croatia, Bosnia and Herzegovina, Macedonia and Serbia. still use the JUS (F.G0.001 1979, F.G0.002 1979, F.G0.003 1979) standards developed in the former Yugoslavia. In addition to typical girth measurements clothing is also marked to identify which of 5 height bands: X-Short, Short, Medium, Tall, X-Tall, and body types: Slim, Normal, or Full, it is designed to fit. Numerous other national standards exist e.g. The common US misses sizes have not had stable dimensions. For example, the dimensions of two size 10 dresses from different companies, or even from the same company, may have grossly different dimensions; and both are almost certainly larger than the size 10 dimensions described in the US standard. Vanity sizing may be partly responsible for this deviation (which began in earnest in the 1980s). There is no mandatory clothing size or labelling standard in the U.S, though a series of voluntary standards have been in place since the 1930s. External websites exist to aid conversion between the different systems. 24" 26.5" 29" 31" 33"
e.g. a dress marked 13-Y-PP or 13-Y-P would be designed for someone with an 89 cm bust and 89 cm hips, while a dress marked 13-B-T would be targeted at a taller individual with 105 cm hips, but the same 89 cm bust. The B fitting adds 12 cm and the T height modifier 4 cm to the base hip measurement 89 + 16 = 105 cm. Additionally there are a set of age based waist adjustments, such that a dress marketed at someone in their 60s may allow for a waist 9 cm larger than a dress, of the same size, marketed at someone in their 20s. The age based adjustments allow for up to a 3 cm increase in girth, per decade of life. ↑ "Japanese Size Charts". International Trade Administration. JIS. Retrieved 2014-11-10. 1 2 "Men's Clothing, Size Conversion Chart – South-Korea". korea4expats. Retrieved 2012-06-15.